Despite being old enough to own my own house, I still have a ton of junk in my parents’ attic. I’m slowly moving all of that stuff to my home. Occasionally I come across something fun, weird or amusing from my past. It Came From the Attic is a series of posts about these odds and ends. 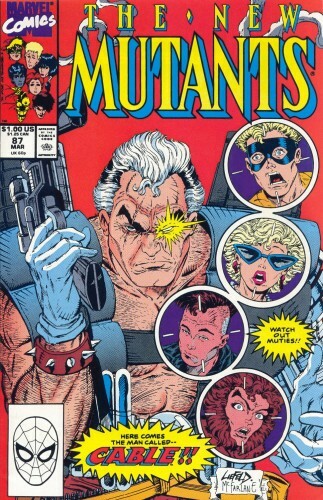 I should probably be more ashamed to admit I was totally in to Rob Liefeld and Cable in the early 1990s. We all were – it was one of those collective psychoses that happen from time to time, like the swing revival of the late ’90s or accepting Paul Hogan as a movie star. 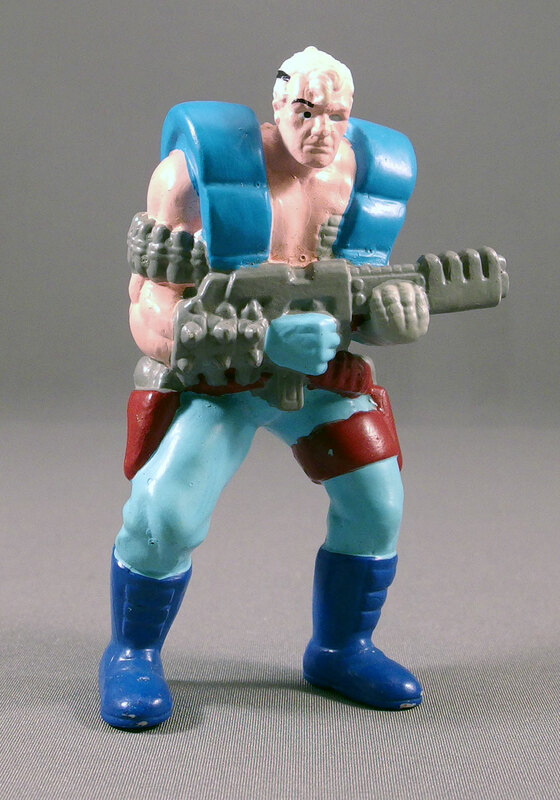 I loved Cable. Loved him. I owned a copy of New Mutants #87. I bought an extra polybagged copy of X-Force #1. I had some sort of black-and-white art portfolio of Rob Liefeld‘s art. ROB. LIEFELD’S. ART. Cable was a nine-year-old’s post-Halloween sugar-fueled dream of a superhero. He was a time-traveling cyborg (the Terminator) with telekinesis (Professor X), a mysterious past (Wolverine), tons of guns (the Punisher) and huge shoulder pads (uhhh…Warren Sapp?). * He’s the kind of thing you’d expect to find in a direct-to-video knockoff of The Terminator, not the most popular comics of the era. But I loved him. We all did. As an adolescent, I certainly didn’t grasp how bad of an artist Rob Liefeld was. I thought he was awesome (just as Rob Liefeld himself did). The only thing I can say in my defense is that I was one of the few people who was happy when Mike Mignola filled in for an early issue of X-Force, because I already loved his art even then. Anyway, action figures of any Marvel superhero were relatively scarce when Cablemania hit. ToyBiz was in the earliest stages of their Marvel figures, but we did finally get a Cable figure in 1992 and man, did I love that figure. But it was quite a wait for that to come out. 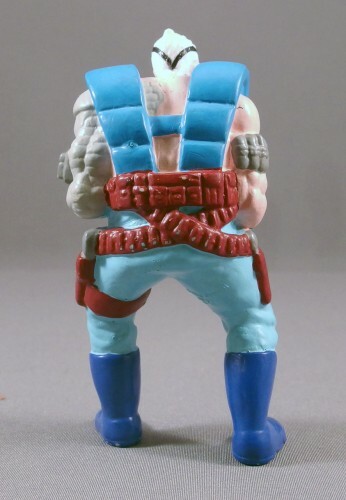 How could I cure my jonesing for a Cable figure in the meantime? PVC to the rescue! I always bought PVC figurines for the exact same reason: because a real action figure was not available. It’s why I also owned a few Batman PVCs before ToyBiz got their line out. 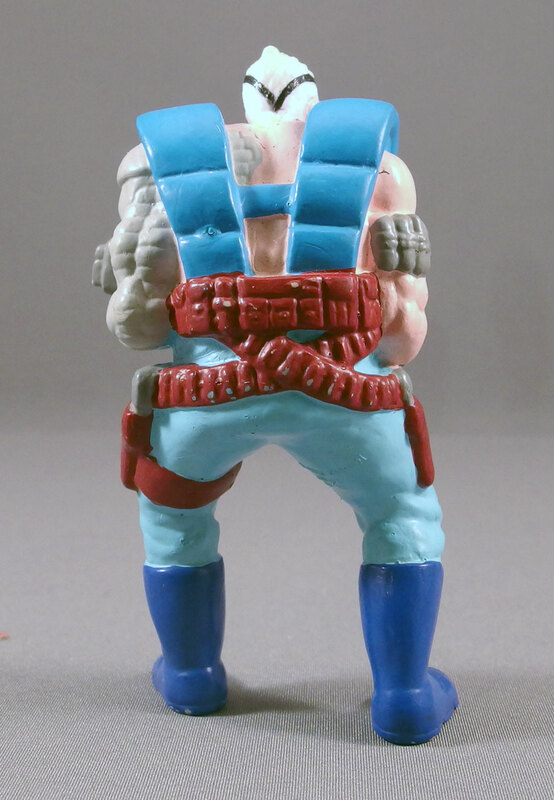 In 1991, ToyBiz’s Cable figure was still a year away, but Marvel managed to rush out this cheap PVC. 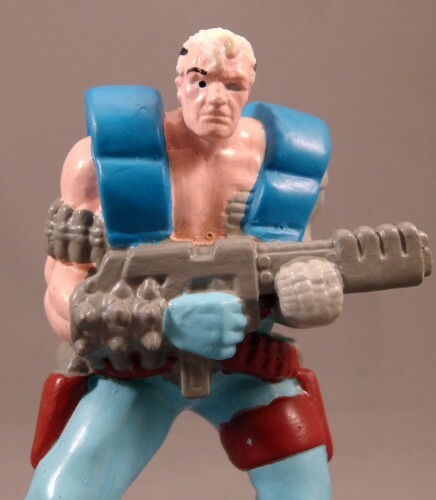 It’s based on Cable’s appearance in the New Mutants, and to my knowledge this is the only toy to feature this look. Seriously, how bizarre are those shoulder pads? I keep trying to come up with some sort of funny comparison to something else, but I’ve got nothing. Nothing in human history looked like those shoulder pads except maybe – maybe – those harnesses on the sort of rollercoaster where you’re part sitting, part hanging. The sculpt isn’t too terrible for a PVC figure, but it appears to have been painted with a brush from a Crayola kit for five-year-olds. The eye is actually silver, perhaps to make it look like it’s “flashing,” but I think they should have just gone with the yellow star. Despite the crappy paint, I’m quite fond of this figurine because I remember my late grandfather buying it for me. I’m sure he didn’t have the slightest idea what the hell it was, but he was always willing to indulge my toy obsession, often to my parents’ chagrin. It’s not the kind of thing I display very often, but it’s a nice little knick-knack and a reminder of my foolish youth. * And there’s more. Just as Deadpool was a rip-off of Deathstroke, Liefeld may have partly ripped off Cable from a Marvel Star Wars character named Beilert Valance. Man I had so many of those pvc figurines. The pre toy biz days were rough. I was totally bummed out when New Mutants became X-Force. I could see a comic I liked becoming something I just wasn't interested in. What can I say I preferred Bird Boy to Shatterstar. Comics in the 90's almost ruined comics for me totally, and Cable could be the figurehead of that movement. Don't feel too bad about liking Liefield and Cable. As lame as the guy's art is, I've found that, over time, I've come to like him. He's constantly done what he wants to do, no matter what anyone else says, and he's been very important in the rise of creator owned comics. So yeah, nobody has feet, but Rob Liefield helped give us Image, which is turning out some of the best material in comics. I love stuff like this. I need to get to my mom’s and dig through the toys I left there. Gotta be some gold hidden in the old toy box. I loved PVC figures, and probably don’t collect them anymore just because palm-sized toys have improved so much since;though my Lego minifigs, Dunnies, OMFG, minimates, and etc. have supplanted my California Raisins, Batman and Robin, MUSCLE, and Army Ants, there isn’t much of a difference between them or my reasons for liking them. I feel like the worm is turning on Liefeld’s reputation. I still see hate for him and his style, but I’ve seen more defenders lately. For my part as a comic fan in the ’90s, I knew his stuff was derivative and not very talented, but didn’t care. After all, what came from that heyday of artist talent that was innovative and lasting? Not being cheeky, I’m asking seriously. The idea of ultra-detail has stuck around, to the point where you can say that Jim Lee-derivative is sort of house style at both DC and Marvel. The ridiculously intricate costumes of the 90s are also back at DC, though that's not necessarily an aesthetic I like. There an interesting trend that I think Geoff Johns made a rather revealing comment about some years ago. When asked why somebody seems to get decapitated in every one of his issues, he responded that he grew up with Mortal Kombat and fatalities, and that's just what his generation thinks is cool. Now, a lot of the top people (at DC especially) are guys who grew up during the post-Watchman/DKR comics are dark period and the Lee/Larsen/Liefield/McFarlane heyday and so their comics are crosshatched and grim because they think that's cool. Perhaps in a few years, we'll see stuff that's a bit lighter, simpler, and more expressive, influenced by Bruce Timm and JLU, for example. And instead of Jim Lee being the biggest seller, Chris Samnee will be the marquee artist. I loved Liefeld in the 90's, hated it in the late 90's, hated him in the 00's but now as an old man, those comics are fun. Are they smart? no. But sometimes big dumb and over the top is a lot of fun. Like a lot of the early 90's 😉 It's become so cool to knock the 90's Image guys and Liefeld in particular, a sign of being hip and with it in comics, that eventually people will see, these comics were popular, because they were fun. And things can go back to FUN at some point… or at least I hope so. A book I've become obsessed with is PROPHET, a semi-reimagining of the Liefeld 90's image comic that was more Liefelded out than Liefeld himself could ever even produce on a regular basis (hense he never really drew it <span class="idc-smiley"><span style="background-position: -36px 0pt;"><span>;)</span></span></span> ) and featured enough muscles, pouches, bad feet, and ripped off cliches to actually make your eyesight diminish. The new version ignores most of that and is an incredible psychedelic, 70's French/Heavy Metal style epic strange journey. Look it up, it's a reason to go to the comic shop every month. Highly recommended. Fun. Also, +1000 Star Wars points to Poe for the Valance the Hunter reference. He predates Terminator too! Trashing Rob Liefeld is lazy internet received wisdom now, but if you flip through any nine given Marvel comics from 1989 and then look at one of Liefeld's, it's easy to see why he became such a sensation. Marvel of the late 80s had a clear house style, and Liefeld came on the scene with a bold approach at the right time and readers responded. All the criticisms of his draftsmanship are valid, but he had guts and shook things up and I give him props.